(Newser) – In Venezuela’s capital, motorcyclists have been known to drive down sidewalks, and cars frequently speed through red lights. 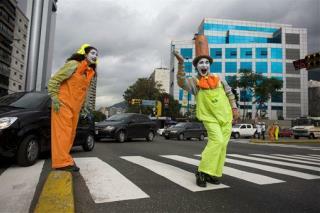 So the mayor is dealing with the problem by deploying … mimes. About 120 of them hit the streets last week in an attempt to shame drivers and pedestrians alike into behaving. “Some people get angry when we reprimand them,” one mime told the AP as she put her hands forward to signify “stop,” then pointed to a red light as a motorcyclist approached. I'd run over a mime. I would've never thought there was a total of 120 mimes on the entire planet, let alone in a small South American country like Venezuela. It must be the quietest country around!